Come fall season and it will literally start raining pumpkin recipes - pumpkin cakes, pumpkin bread, pumpkin pies, puddings - you name it ! Who can resist warm spiced desserts on a cool evening? You can actually smell the aromas of cinnamon and cloves wafting through those inviting pictures,. Its hard trying to resist the urge to get into the kitchen and fire your own oven and start baking one of those. But again,why resist at all? Pumpkin puree is often used in baking and desserts. Don't worry about getting canned pumpkin, I tried using it once, can't say I loved it. Thankfully, it is so easy to make your own puree at home. The humble vegetable adds moisture, nutrition and texture to dishes,baked or otherwise.Since it doesn't have an assertive taste or smell, it can be so easily disguised in both sweet and savory food, parathas,kheer, soup and more . A mother's dream come true if you ask me! 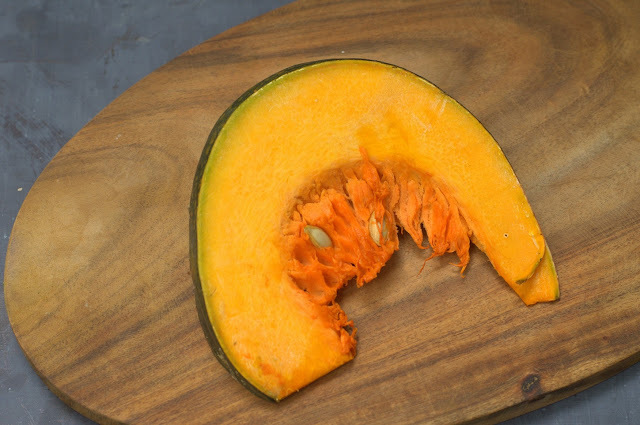 You can bake pumpkin in the oven, cook it in the microwave or even steam it in the pressure cooker. I personally prefer baking it as I find that it cooks most evenly. Please do try all three methods and stick to whatever works best for u. I use this variety pumpkin though sugar pumpkins are most commonly used. For all three methods, we need to remove the stem. Apparently the stem gives off a terrible odor and then we can't risk the stem burning in the oven or the microwave. Wash ,dry and slice the pumpkin into wedges, scoop out the seeds and the fibrous parts. One wedge this size gives me about 1/2 cup pumpkin puree. To bake it in the oven (OTG or convection mode in microwave) Preheat the oven to 190 C. Wrap the wedge(s) in aluminum foil. Place on a baking sheet and bake for 40-45 minutes or until fork tender. Cool completely,scoop out the flesh using a spoon. Process until very smooth. Do not add water while processing unless absolutely necessary. Add only a teaspoon if needed. Press the puree through a strainer to get rid of any fibres . Microwave method: Place the wedge in a glass bowl and cover with a microwave safe plate. Microwave on HIGH for 4-5 minutes or until fork tender. The cooking time depends on the wattage of your microwave Be very careful as even one extra minute can make the pumpkin dry and rubbery, unusable. Sometimes I find that parts of the pumpkin are not cooked well enough, so need to be discarded. In this case, better to microwave more pumpkin than you think is needed. So I prefer not to cook in the microwave unless I am in a real hurry. Pressure cooker method Place the pumpkin wedge in a vessel. Do not add any water in the vessel. Cook for about 2 whistles or until the pumpkin is soft. Cool, scoop out the flesh and process. if the pumpkin has left any juices, do not add it to the puree. It will make the consistency thinner. 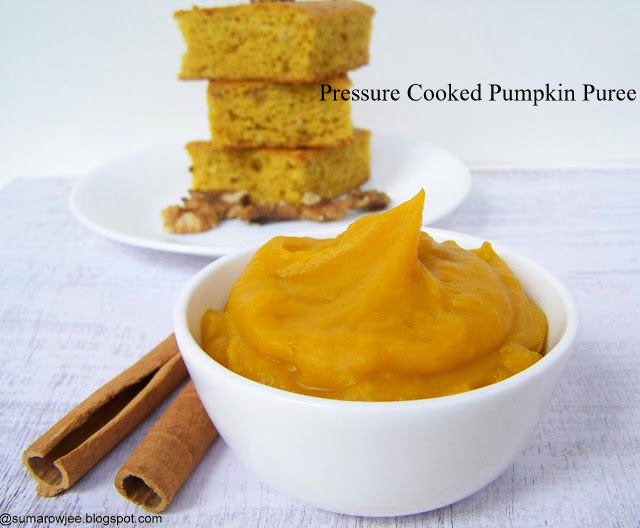 I find that pressure cooked pumpkin is a bit more watery than the oven baked thing. Should work fine for kheer, stove-top puddings, parathas etc. But for baking I would prefer the thick oven baked puree. You can refrigerate the puree for a couple of days or freeze it small portions. 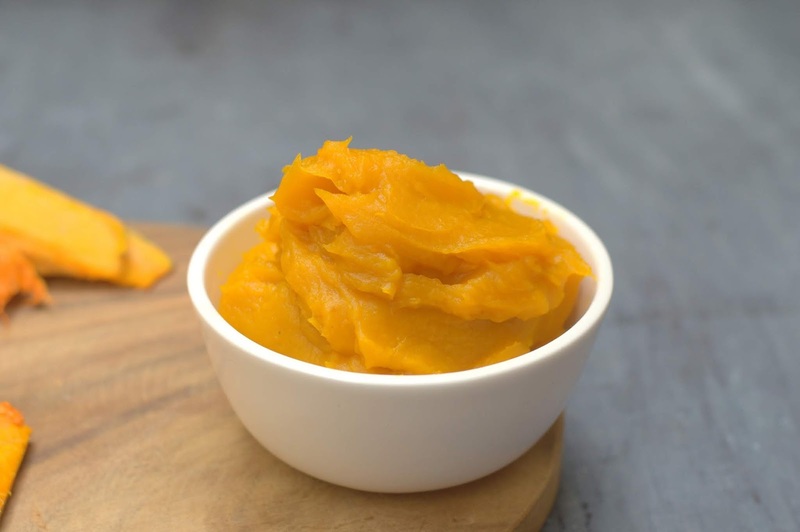 So make your own pumpkin puree, get ready for fall baking!